I have mentioned many times that my belief is photographers should always carry their cameras. This is how you get great shots. Sure you can scout a great location and show up during magic hour and get a great shot but I find some of my favorite shots end up being unplanned. Often it will be a scene unfolding, the way the light is hitting a building, a person, or an object. We pass these in our daily lives. As photographers we learn to focus on these occasions and for those of us with a camera in hand, we capture them. I am lucky enough to live in a great city with a tremendous amount of subject matter to shoot. I constantly have a camera in my hand or within reach. While sitting at my desk the other day I turned and looked out the window and was taken aback by the beautiful view. The the ambient light began to create balance with the neon that was begining to turn on. The sky was showing the last hint of color as the city night began to come alive. It is times like these that I am glad to have my camera so I can remember this view. Today around 2PM I heard what was a never ending trail of sirens that sounded like a 4 Alarm Fire. My office is on the 29th floor so there has to be a lot of noise going on to capture my attention 500 feet above. I had not had my lunch yet and needed a coffee so I grabbed my camera and took a walk down and see what was happening. There probably 15-20 Fire Trucks responding to a 'fire' a few hundred feet down the road. 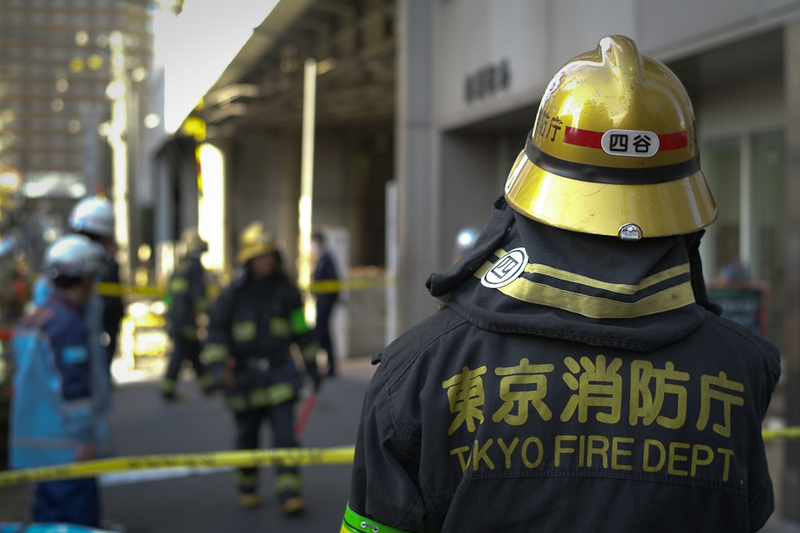 For those who do not read Japanese, you can tell from the kanji on some of the helmets that there were responders from many different locations; Yotsuya, Shibuya, and even Shinagawa. 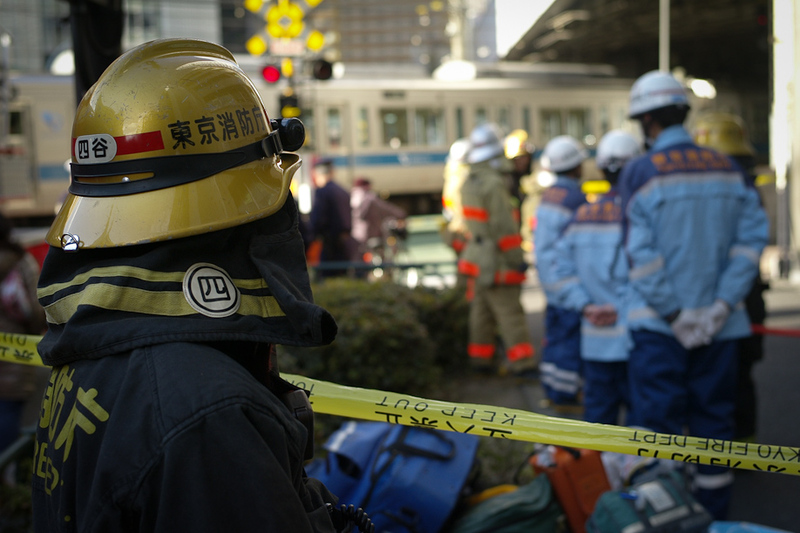 There were lots of medical personnel on standby and police were everywhere. I kept asking if there was a fire and someone finally said there was but no water was needed. As quickly as they came they started to pack up and leave. I am not sure if this was a giant drill or a scare of some sort but it was a pretty massive response. 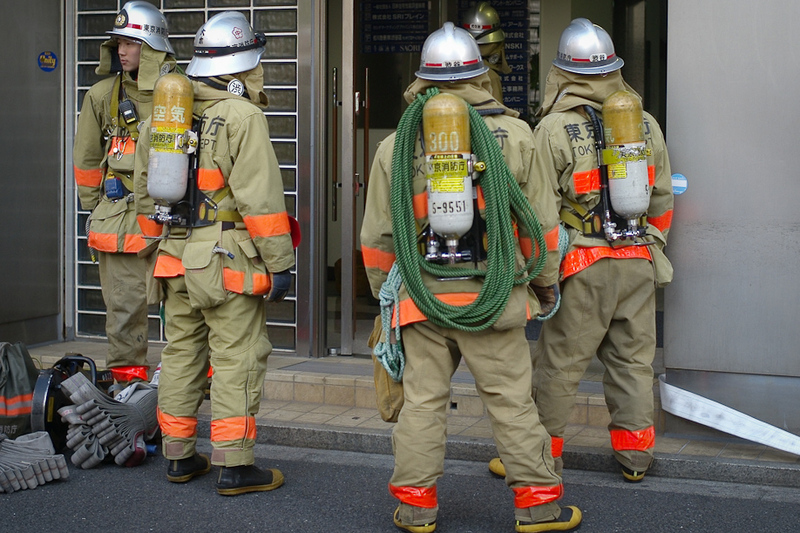 I imagine you have to contain fires pretty quickly when they break out in a city like Tokyo. 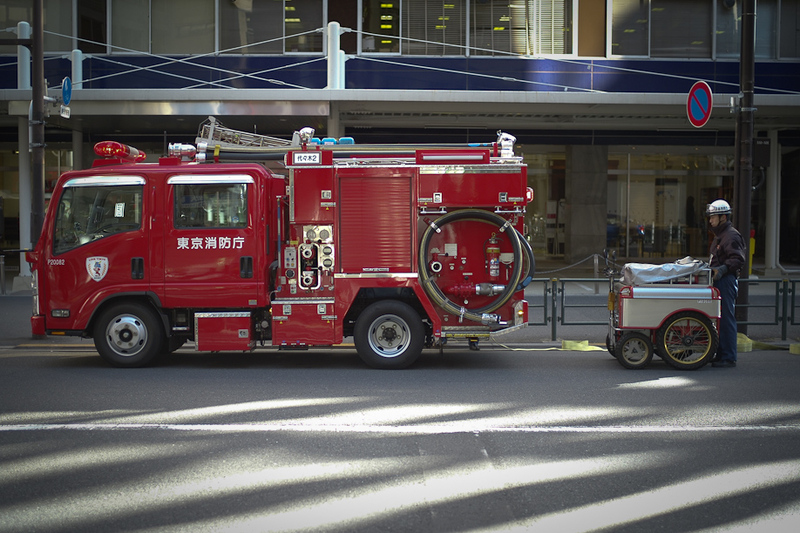 ..and since this is Japan there must be a cute mascot, even for Fire Trucks. Meet Kyuta! This guy seemed very interested in my camera...and was kind enough to pose for me. Feel free to comment and let me know what you think of today's post! If you like what you saw today, please consider sharing it by clicking one of the icons below.